Dinan’s M6 Convertible exhaust system provides maximum flow characteristics for optimum power gains while producing a civilized, yet very sporty exhaust note that is appropriately aggressive at wide open throttle. Special Note: This is for the Convertible only. The Dinan M6 exhaust system provides maximum flow characteristics for optimum power gains while producing a civilized, yet very sporty exhaust note that is appropriately aggressive at wide open throttle. And there's none of that irritating low rpm ''drone'' that is common with so many aftermarket mufflers. 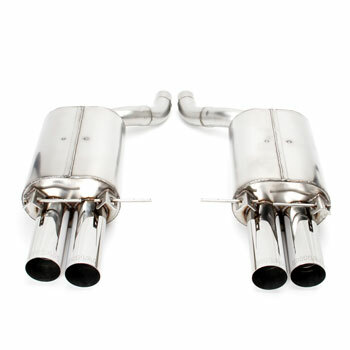 The mufflers are manufactured from 100% 304 stainless steel inside and out for maximum resistance to corrosion and nearly a 30% reduction in weight, eliminating over 20 lbs. Utilizing the factory brackets and hangers, the Dinan exhaust mounts in a factory-like fashion for a perfect fit and clean installation.